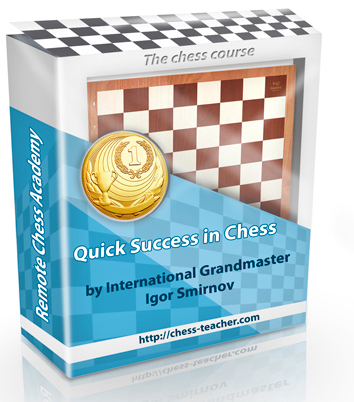 Chess courses by GM Igor Smirnov: New Opening Course Is Coming Soon! New Opening Course Is Coming Soon! I have some good news for you. The new opening course is almost ready! I hope to finalize it very soon, and to publish it on the 28th of October. They observe the games of strong players in this opening. In either case it assumes that a student will remember the lines and plans demonstrated by a GM, and then reproduce it in his/her games. This kind of training makes sense for sure. But there’s another question here which is much more interesting and important: how do those Grandmasters detect the best opening moves and variations? If you can do the same, this will make you a lot better player. It’s not just learning a few new opening lines; it’s a whole new level of playing chess! In many tutorials we can find some opening rules: develop pieces, fight for the center etc. However, I’ve never seen a COMPLETE theory of an opening play that will explain everything “from A to Z”. That is why I decided to create such a comprehensive guide. Why GMs play some strange opening moves that seemingly break the opening rules? How to deal with early attacking attempts of your opponent? What is the reason behind the opening moves played by GMs? This comprehensive guide for opening play is the 1st major thing you will learn in the new opening course. The 2nd thing is a powerful and “compact” opening repertoire for you. Nowadays there is an overabundance of opening tutorials, and the importance of opening preparation is highly overestimated. Your general chess skills (positional understanding, ability to calculate variations, etc.) are the most decisive factors. Knowledge about specific opening lines is a secondary thing. Nevertheless you can’t ignore opening preparation. The opening stage is one third of the game, and we may say that 33% of your overall result will depend on your opening play. In conclusion, you need to have a powerful opening repertoire that does not require you to study tons of theoretical variations in each particular opening. And so I’ve done all of the “dirty work” for you. I’ve selected the best opening lines, analyzed them and removed any unnecessary lines and variations. Thus you’ll study only those lines that you need, and be able to do it quickly and efficiently. 1) A COMPLETE theory of opening play. 2) A powerful and “compact” opening repertoire. Of course it contains other useful things as well, but these 2 are the most important. I’ll provide more detailed information about the new opening course closer to the date of release (28th October). Soon you will learn how to play an opening properly. Now let’s see how you should NOT do it. This game was played a few days ago. Black got into a losing position right after an opening. Now your task is to find the most powerful continuation for White.